View SMFM'S Advocacy Agenda here. April 2, 2019: SMFM submits Public Witness testimony to the House Labor-Health and Human Services-Education Appropriations Subcommittee. January 22, 2019: SMFM filed an amicus brief with ACOG, AMA and others in support of Planned Parenthood. December 10, 2018: SMFM joined with national organizations dedicated to women's health to write to Speaker Ryan and Minority Leader Pelosi in support of the Preventing Maternal Deaths Act (H.R. 1318). November 16, 2018: SMFM joined the March of Dimes, AAP and other national organizations to write to the House Committee on Energy and Commerce during Prematurity Awareness Month to urge them to advance the PREEMIE Act in the the full House of Representatives. November 14, 2018: SMFM, along with a number of national organizations, write to House and Senate leadership, urging them to bring H.R. 1318/S. 1112 up for a vote before the end of the year. October 24, 2018: The Coalition to Advance Maternal Therapeutics, which SMFM is a founding member, writes to Sec. Azar urging him to implement the recommendations of the Task Force on Research Specific to Pregnant Women and Lactating Women (PRGLAC) as soon as possible. September 27, 2018: SMFM submits testimony to the House Committee on Energy and Commerce for a hearing entitled, "Better Data and Better Outcomes: Reducing Maternal Mortality in the U.S."
September 14, 2018: SMFM joins with ACOG, March of Dimes, AMCHP and the Preeclampsia Foundation to reiterate support for the discussion draft of H.R. 1318, the Preventing Maternal Deaths Act. September 10, 2018: SMFM writes to CMS Administrator, Seema Verma, to provide comments on the proposed revisions to payment policies under the physician fee schedule for payment year 2019. August 30, 2018: SMFM signs on to a letter to Sec. Azar expressing opposition to the Trump Administration's proposed changes to Title X.
July 31, 2018: SMFM partners with Planned Parenthood, ACOG and other national organizations to express our opposition to the Trump Administration’s proposed changes to Title X.
July 13, 2018: SMFM partners with AMCHP, March of Dimes and other national organizations to express concerns to Sec. Azar about reports that the United States delegation to the recently convened World Health Assembly sought to weaken a resolution designed to support breastfeeding. July 3, 2018: SMFM partners with March of Dimes, AAP and others to write to the House and Senate in support of the PREEMIE Reauthorization Act (H.R. 6085/S. 3029). June 25, 2018: SMFM writes to Senators Alexander and Murray in support of the Maternal Health Accountability Act and the PREEMIE Reauthorization Act. June 25: In coalition with other MCH organizations, SMFM writes to the Senate and House champions of the PREEMIE Reuthorization Act (S. 3029/H.R. 6085), calling for its swift passage. June 20, 2018: Together with the US Breastfeeding Committee, SMFM write to Rep. Maloney and Sen. Merkley in support of the Supporting Working Moms Act. June 20, 2018: SMFM writes to Congressional appropriators in opposition to the inclusion of ideological policy riders in the FY2019 appropriations bill that are harmful to women’s health. May 29, 2019: SMFM, along with the Family Planning Coalition, write to the Senate Appropriations Committee requesting $327 million for Title X in FY 2019. May 11, 2018: In honor of Mother's Day, SMFM writes to House and Senate leadership to express support for H.R. 1318/S. 1112, legislation to address maternal mortality in the U.S.
May 9, 2018: SMFM writes to Reps. Walden and Pallone in support of H.R. 5333, which will reform the over-the-counter (OTC) drug monograph system. April 25, 2018: Together with the Family Planning Coalition, SMFM writes to Representatives Cole and DeLauro requesting $327 million for publicly funded family planning and sexual health care services via Title X in FY 2019. April 11, 2018: SMFM provided comments on the Opioid Crisis Response Act of 2018 to Senators Alexander and Murray. April 10, 2018: SMFM writes to Representatives Engel and Strivers and Senator Stabenow in support of the Quality Care for Moms and Babies Act. April 9, 2018: SMFM joined the CDC Coalition to write to House and Senate Appropriators asking for $8.445 billion for the Centers for Disease Control and Prevention’s programs in the FY 2019 Labor, Health and Human Services, Education and Related Agencies Appropriations bill. April 3, 2018: SMFM joined Pew Charitable Trusts, March of Dimes and others to support H.R. 5333, the Over-the-Counter Monograph Safety, Innovation, and Reform Act of 2018, which would would modernize the FDA's system for regulating nonprescription drugs. April 3, 2018: SMFM signs on to a letter to House and Senate Appropriators asking for $660 million for the Maternal and Child Health Services Block Grant in the FY2019 Labor, Health and Human Services, Education & Related Agencies Appropriations bill. March 27, 2018: SMFM joined the Friends of AHRQ to write to House and Senate Appropriators to request $454 million in budget authority for AHRQ for FY2019. February 26, 2018: SMFM public comments to PRGLAC Task Force. 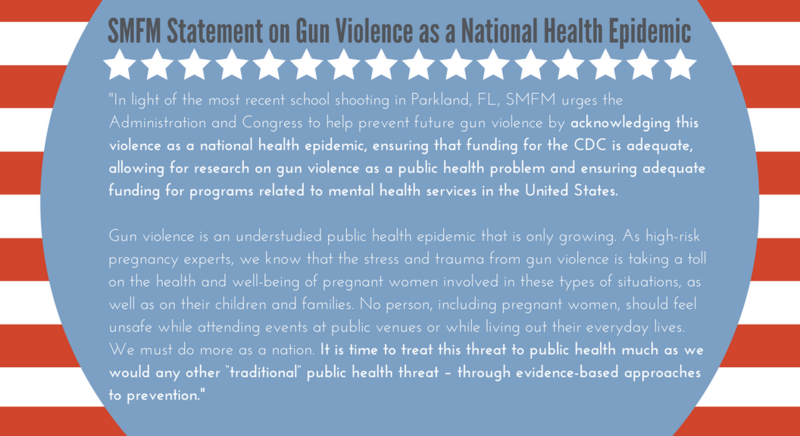 February 16, 2018: SMFM social media statement on gun violence as a national health epidemic. January 17, 2018: SMFM signs on to a letter to Reps. Burgess, Walden, Green, and Pallone in support of bipartisan legislation to update the over-the-counter drug monograph.